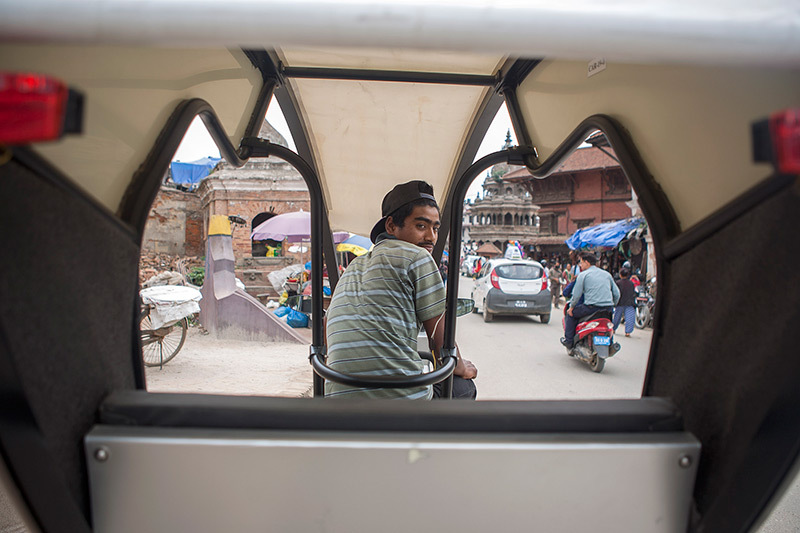 Kathmandu’s rickshaws have received an eye-catching facelift, but is it what the city needs? May 20, 2017-If you find yourself in and around the Patan Durbar Square, you are likely to find a couple of three-wheelers that immediately stand out. Difficult to categorise as tempo or rickshaw, pedi cabs are misfit of sorts. Krishna Kayastha, a 23-year-old driver, waits for his customers in one of these vehicles. To “What is this?”—a question he is asked at least 10 times a day--he replies, “A modern rickshaw,” and offers to take you on a ride. “I can take you anywhere from Patan Dhoka to Balkumari, but we can’t hit the main road, we are not allowed there,” he says. This cycle rickshaw definitely looks and feels much dapper than the last one you rode in Thamel or Basantapur. Easier to climb on, it is compact; it is light; the seat feels softer, and there are handle bars you can hold on to. Like a tempo, this tri-cycle ride also comes with a headlight, and two sidelights. Thanks to the bumpy streets, the thrill of inching through the Valley’s streets is still there, but the ride is obviously smoother. While it can get awkward as pedestrians stop to look at this new head-turner, you are likely to enjoy navigating through the hidden gallis of Patan that you wouldn’t have taken otherwise. “This one is much lighter than my last one. It also grabs a lot of attention,” Kayastha elaborates on his one-month-old vehicle. “But it is not as easy as it sounds. DIGP Mingmar Lama of Metro Traffic Police says, “Any vehicle that does not carry a registered number plate cannot be seen on the roads of the city. It is our duty to keep these vehicles away for everybody’s safety. Once the registration is done, we have no problem with whatever route these rickshaws take.” The rickshaws, like Kayastha’s, are not registered vehicles yet. Kayastha has been driving haul rickshaws for four years now. He earns a meagre income compared to his counterparts who drive fuel- or electricity-run tempos and taxis; and the job is laborious and the opportunities limited. He lives in the fringe, and ensuring daily income is of utmost importance. Every now and then, he takes up a job that comes his way for extra income. Recently, he was randomly selected—from the existing pool of city’s rickshaw drivers—to participate in a pilot project where he was handed over this prototype pedicab. In a month’s span he has hauled at least 500 customers, mostly Nepali. “Last month, we rolled out 46 prototype modernised rickshaws in Nepal. Made of stainless steel, they are lighter, sturdier and definitely more attractive. Half of these pedicabs are fully manual—pedal-only—equipped with gear and brakes. The other half comes with an electrical assistance powered by a car battery,” informs Prashanta Khanal, national coordinator of Modernised Pedicab Project, funded by the Asian Development Bank. But at a time when the roads seem to be under perpetual construction and the traffic congestion is a growing problem, how practical and sustainable are pedicabs in Nepal—regardless how modern they are? According to Khanal, potholes in the Valley won’t be a problem for these sturdy rickshaws. Besides, this urban vehicle doesn’t serve so much as a means for public transportation as it does as a connecting vehicle. “If you look at the architecture of the core areas of Kathmandu, it has been designed as a walkable city. Both private and public motorised vehicles definitely need to be regulated if not banned in areas such as the Durbar Squares. The new pedicabs could definitely be an appropriate mode of transport in these old-quarters. Are they practical? Yes. Are they sustainable? Of course. But, then, the important question is how well they are going to be regulated. Because if they are not it’s only going to back-fire by further overcrowding the already congested streets,” says Acharya.